In May, we announced the Xbox Adaptive Controller – a first-of-its-kind controller for gamers with limited mobility, and we appreciate the overwhelmingly positive fan feedback received to date. On our journey of inclusive design at Microsoft, we are looking at extending this methodology and its principles—enabling and drawing on the full range of human diversity—to the complete consumer experience, including where that very journey starts – with product packaging. With the Xbox Adaptive Controller, we aimed to do something new and different in the packaging space and push the boundaries beyond what has been done before at Microsoft. We had to ask ourselves, “What does this packaging need to do?” That’s where we began re-approaching our assumptions on what accessible packaging needed to be. There’s lots that can be done in the ‘accessibility’ packaging space, but for this job, we were focused on making the packaging more accessible in the area of mobility, specifically. This challenged everything we knew at Microsoft about packaging requirements, and how we needed to gauge success. In fact, beta testers were a significant part of the early review process and much of the final design elements can be contributed to their feedback. It was important for us to understand what was useful on a package, and what should be avoided. Insights gleaned from beta testers and UX respondents was invaluable during our creative explorations. For example, the team developed a ‘no teeth’ principle, reflecting the common behavior practiced by individuals with limited mobility when opening packages. Often when engaging with packages not designed for maximum accessibility, customers resort to improvised means of accessing the product –including using their teeth. With the Xbox Adaptive Controller packaging, we wanted to ensure that no such extreme measures would be required! We also heard how painful twist ties, zip cords and paper that can cause cuts can be—things commonly overlooked by many, but which become so much more difficult for people with limited mobility to navigate. Both the single-shipper and retail package have been designed to “unfold” to reveal what’s inside with minimal friction. The shipper reveals the retail package, and the retail package reveals the Xbox Adaptive Controller. Discreet air cells integrated into the shipper packaging for protection for the product while maintaining a small footprint and clean design. Every major step of the unboxing incorporates loops, a feature that we heard resounding positive feedback on from beta testers. Loops are a highly proven lever to assist in accessibility. The leveraging of loops begins with the tear-strip on the single shipper, kicking off the out-of-box experience seamlessly. On the retail box, a specially designed ‘break-the-seal’ label (which keeps the box lid secured to the base) employs two loops, for multi-directional removal. A soft, grey loop initiates the opening experience, then there are integrated loops on both the paper Quick Start Guide (QSG) and cable folio. There are five loops on the XAC packaging from beginning to end. An open cavity area under the controller, enabling multiple ways to remove the controller from the box, including pulling via the loop or sliding it out directly. The box has a low center of gravity, grounding the unboxing experience and creating a sense of stability for the end-user. Additionally, the hinged lid provides a low-effort, single-pivot access into the package. It was through continued engagement with the disability community and research groups that we grew our understanding of what accessible packaging could include. Every time we approach packaging in a new way, we strive to learn as much as we can and leverage those insights across all our work. 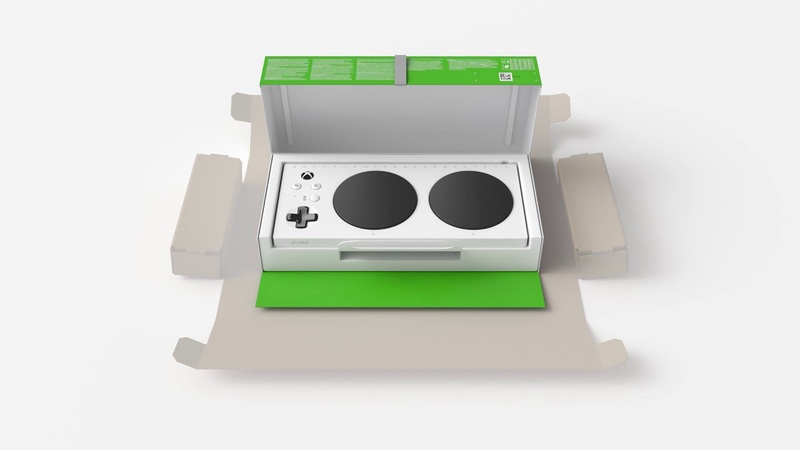 The Xbox Adaptive Controller required us to think in depth about accessibility in packaging, and we believe it is a powerful milestone on our accessibility journey. The Xbox Adaptive Controller – complete with accessible packaging – is available for gamers in September of this year, and available for pre-order now for $99.99 USD from Microsoft Store. Learn more about the Xbox Adaptive Controller here.